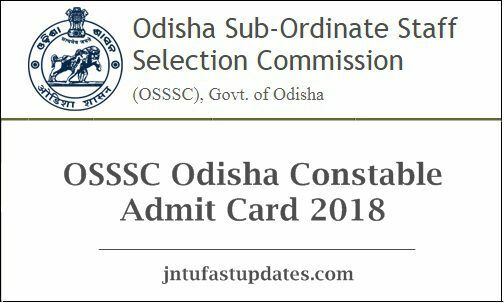 OSSSC Excise Constable Admit Card 2018: Odisha Sub Ordinate Service Selection Commission (OSSSC) is going to conduct the Excise Constable written test in the month of December. Hopefuls applied for the Odisha Excise Constable posts can download their respective hall tickets from the OSSSC website, osssc.gov.in. Candidates going to attend the excise constable written test must download the hall tickets and carry to the examination. The OSSSC will conduct the written test in various examination centers across the state. This year a huge number of competitors are going to clash for the Odisha Excise Constable examination. All the candidates who are going to attend the examination must carry the admit cards. Otherwise, the candidates will not be allowed to attend the test. Candidates who are going to attend the OSSSC Excise Constable examination can proceed with the article to know more details. Odisha Sub Ordinate Service Selection Commission (OSSSC) is the state government organization deals with various state government operations. The organization annually issues various job notifications for the people who wish to get state government jobs in Odisha state. OSSSC has recently issued a notification for 219 excise constable posts. Thousands of aspirants wishing to become the constable in the state of Odisha have applied for the announced posts. The candidate selection will be done based on various rounds Physical Standard Measurement/Physical Efficiency, written exam and Certificates Verification. The candidates qualifying the selection process with merit will be shortlisted for the excise constable posts. Must to carry any of the valid identity proof. Report at the examination hall before 30 minutes of the test. On the homepage, you can find the ‘Download Odisha Excise Constable Hall Ticket 2018’ Link.